Style your contemporary home decor theme with luxurious colorful Indian elephants, they are sure to add a touch of class to any living space. 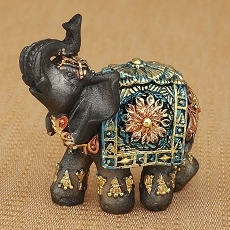 The elephants are made from poly resin and are hand painted in a rich mahogany brown color. The elephant wears a blanket and headdress beautifully detailed in striking colors of blue, orange and gold. An eye-catching ornate flower design and 3 sparkling amber stones complete the look. This figurine is a small size, mix and match with other sizes in the same design to create a fabulous set. Size 4" x 4 1/2"
Adds a stylish touch to a contemporary home decor theme!